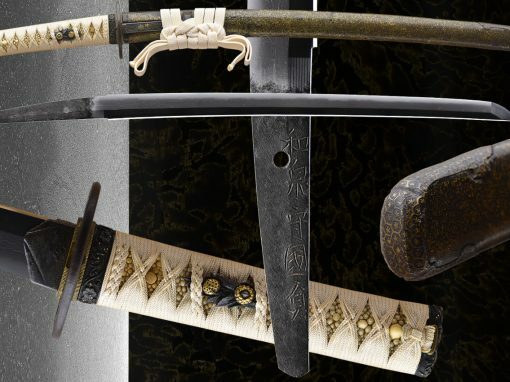 This sword was previously purchased about 6 or 7 years ago from Japan by a client who no longer collects swords. 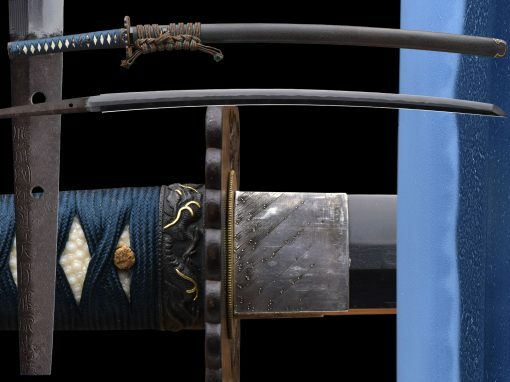 The blade is a longish katana which is ubu with one hole. 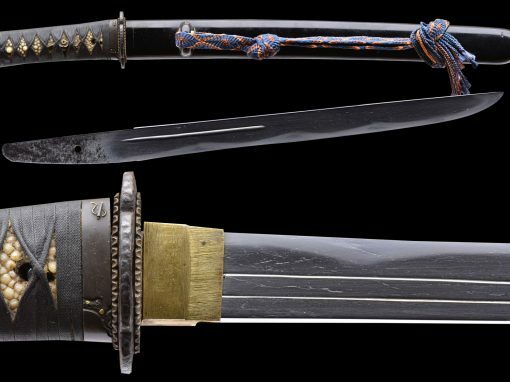 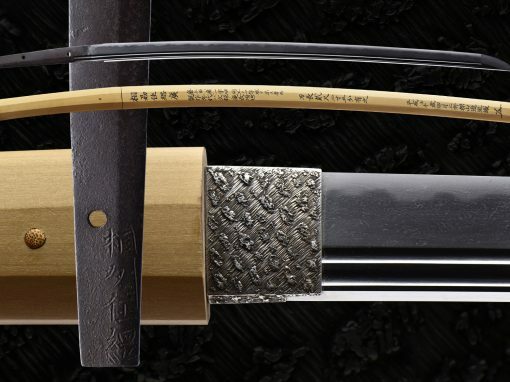 A beautifully preserved unsigned Shinto Katana that has incredible workmanship and ko-gunome/midare hamon. 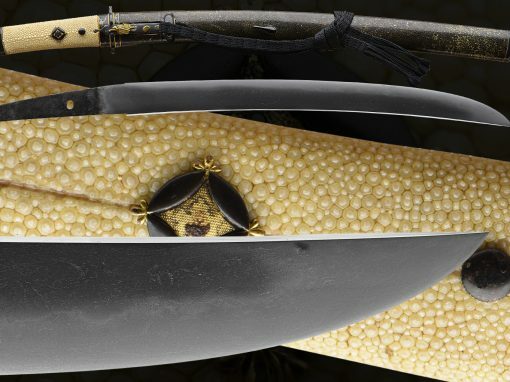 This blade is ubu and unsigned. 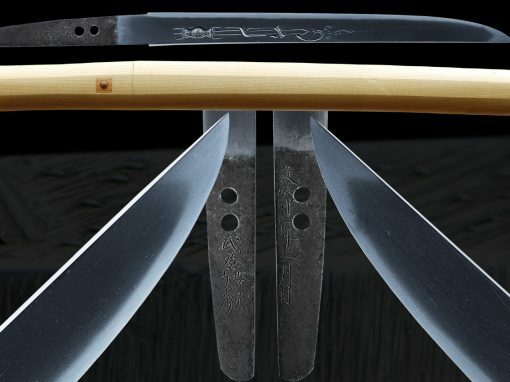 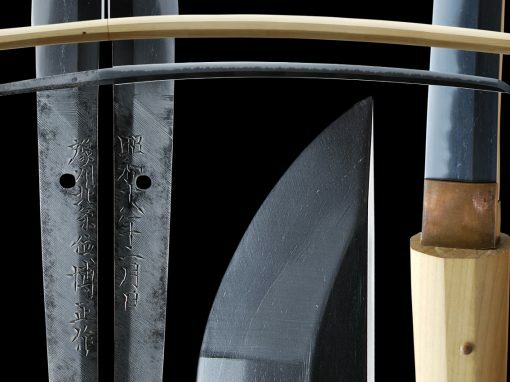 A good blend of activity can be seen and appreciated within this blade in the Shinto tradition. 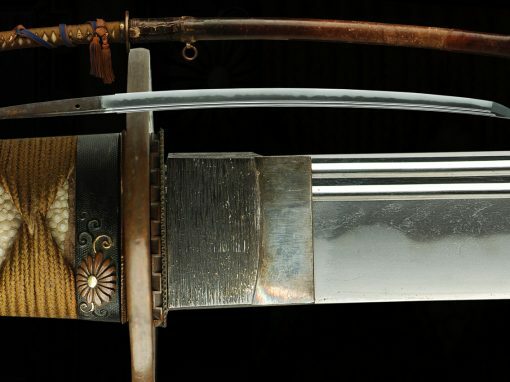 There are a few rough areas and hadaware. 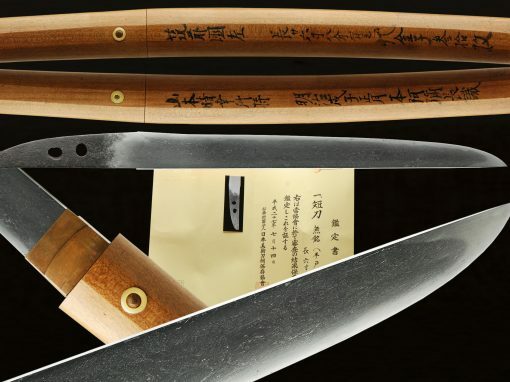 This blade comes with a paper from the nthk authenticating the age and maker. 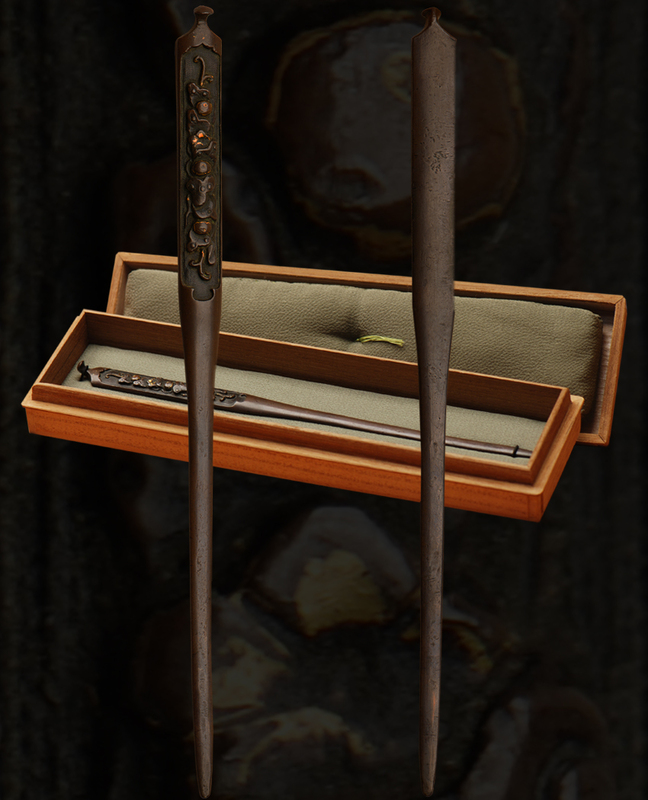 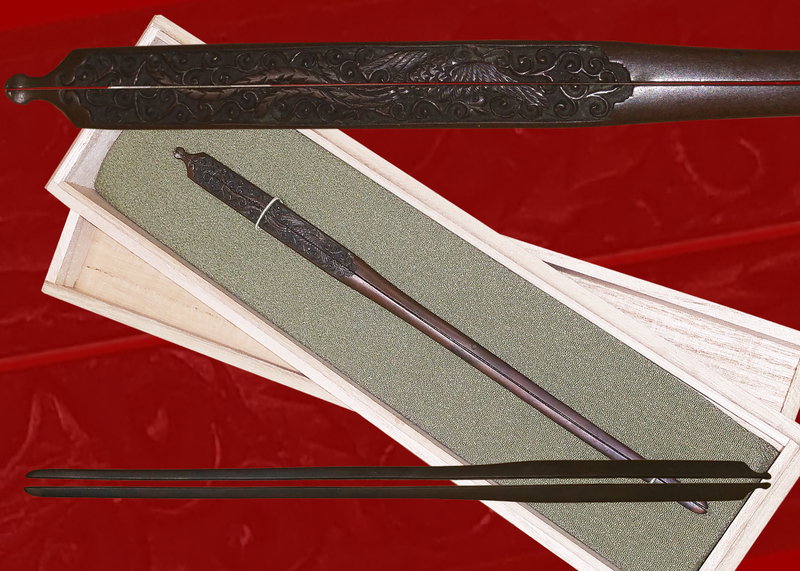 It is in an older polish with a very nice set of koshirae. 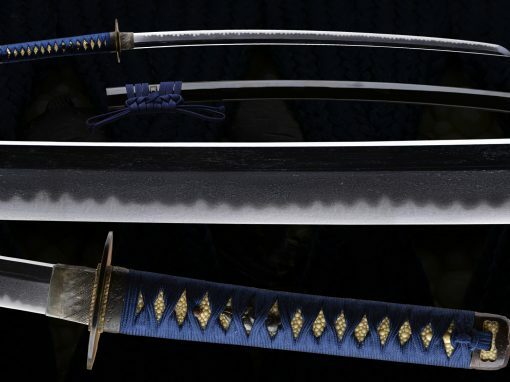 The pictures do not do justice to this sword and looks much better in hand. 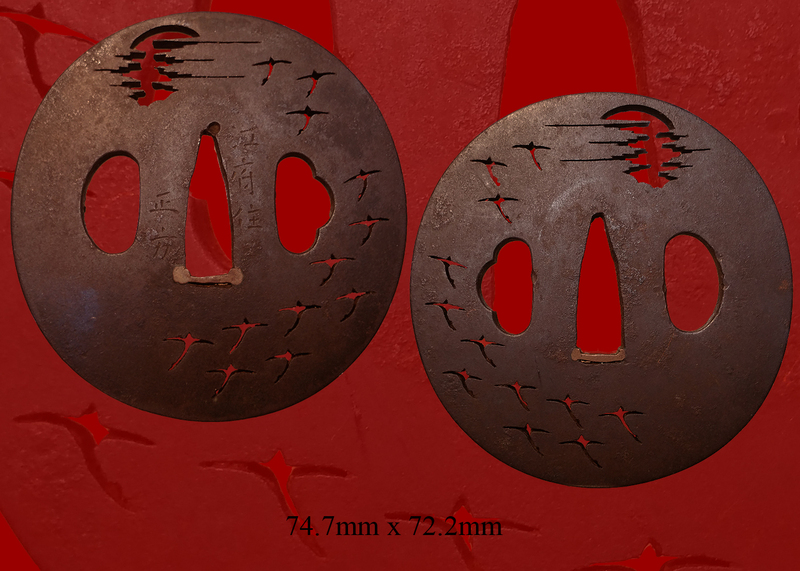 It has some hataraki and ko-nie appear. 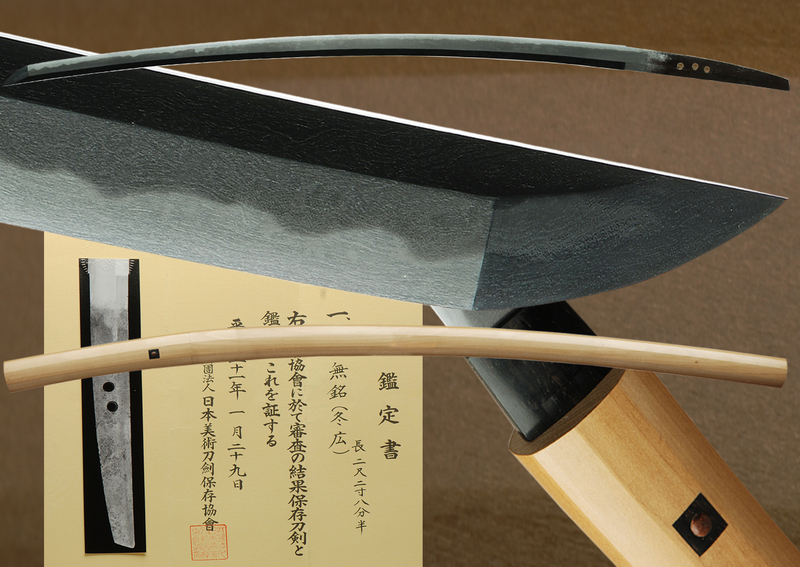 The hada is well forged with an appearance of swirling itame with mokume. 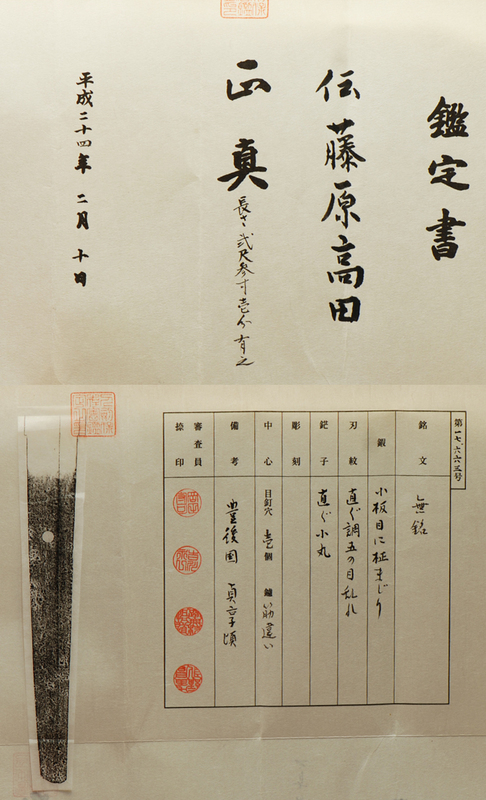 The boshi is ko-maru and a bit longish . 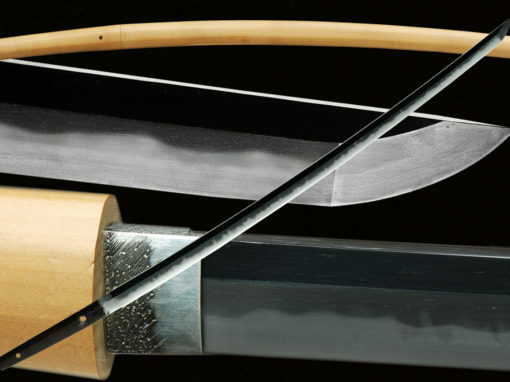 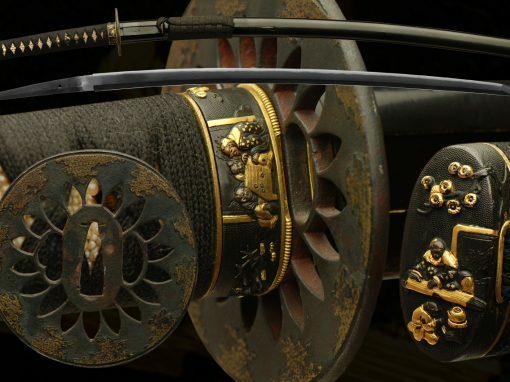 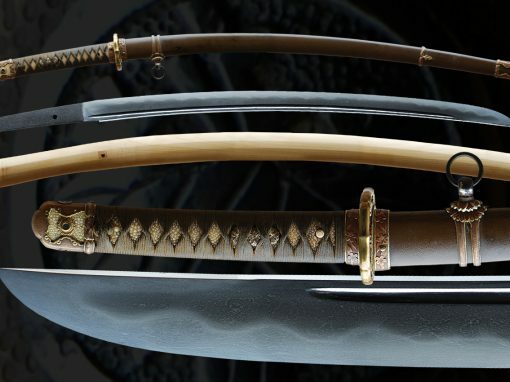 This Katana has an elegant shape and is very well balanced. 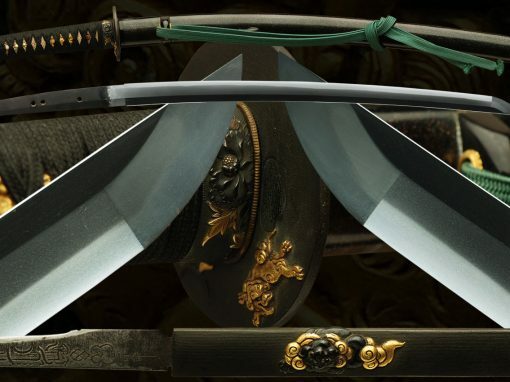 The curvature is very very nice and the blade overall is well balance and not heavy. 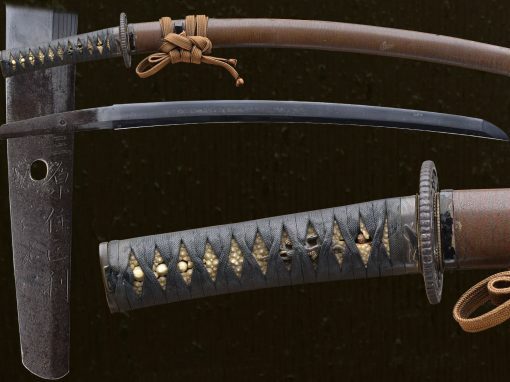 The mounts are very nice and add to the overall value of this sword. 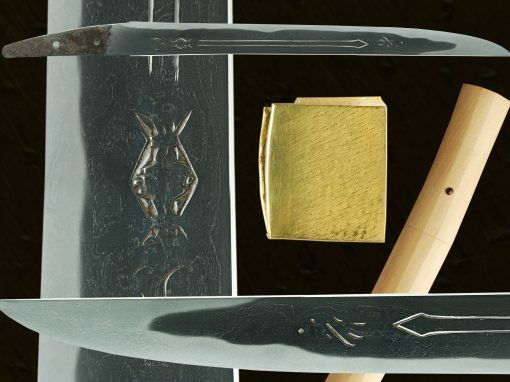 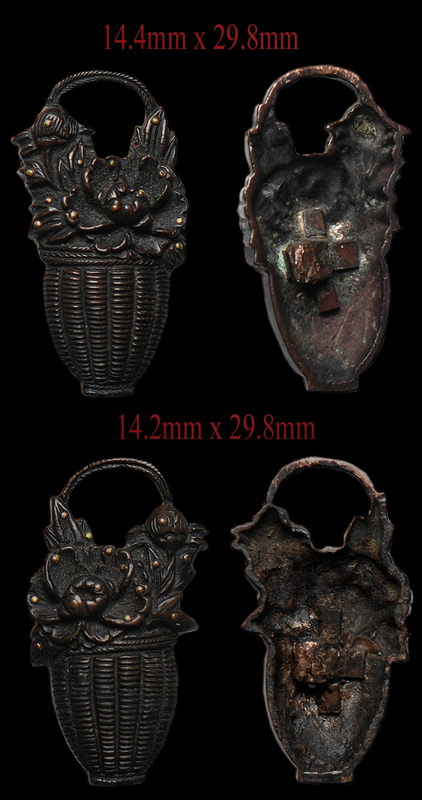 The koshirai is of rolling cloud like formations for the fuchi / kashira.The saya is a wood like pattern in lacquer design.the menuki are of ShiShi. 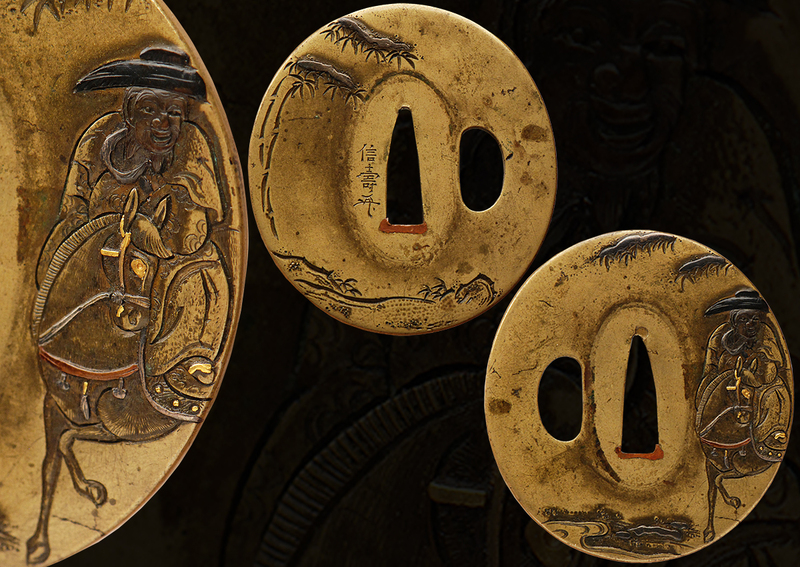 There is a gold washed habaki. 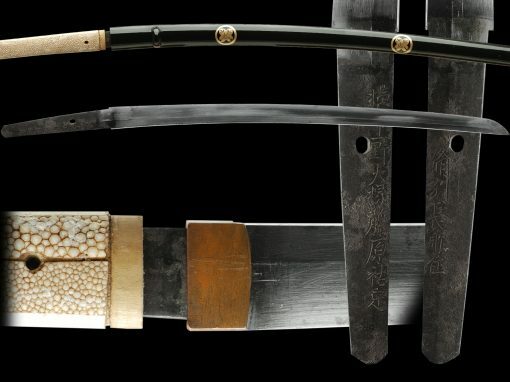 The same is a black lacquered finish with brown ito and a brown sageo to match.. 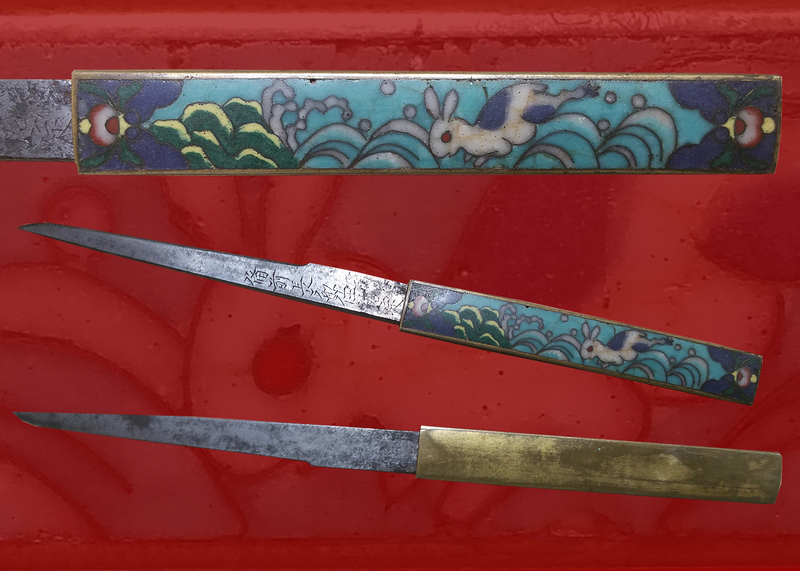 This is a lovely set of mounts with a nice longish blade. 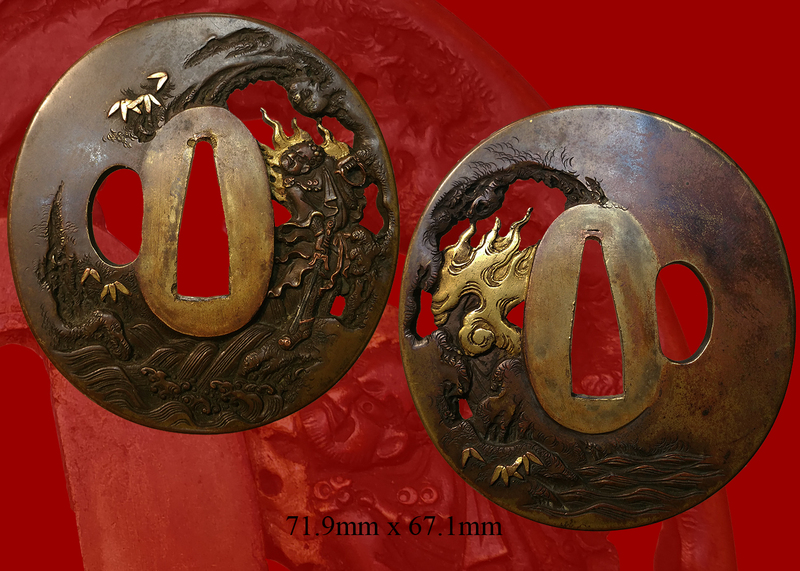 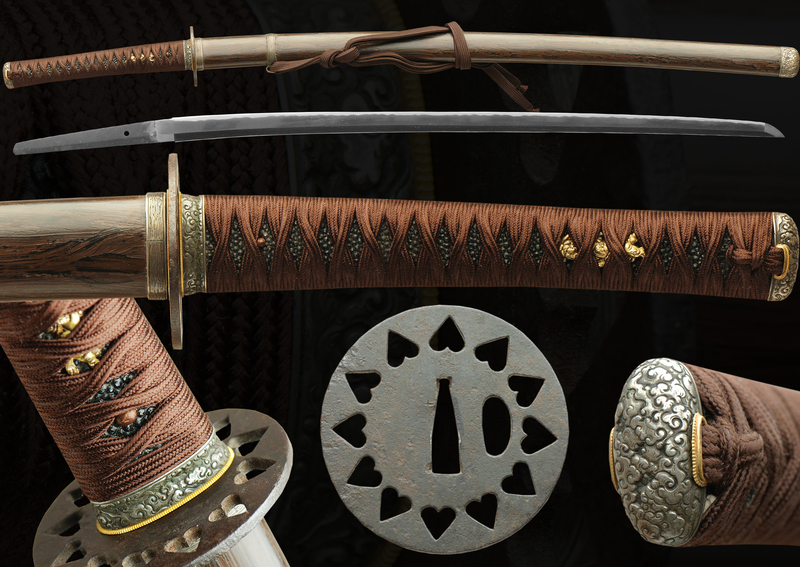 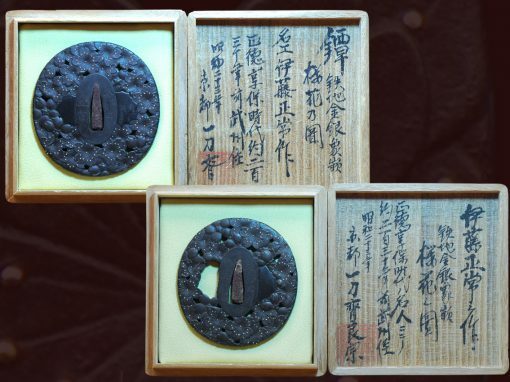 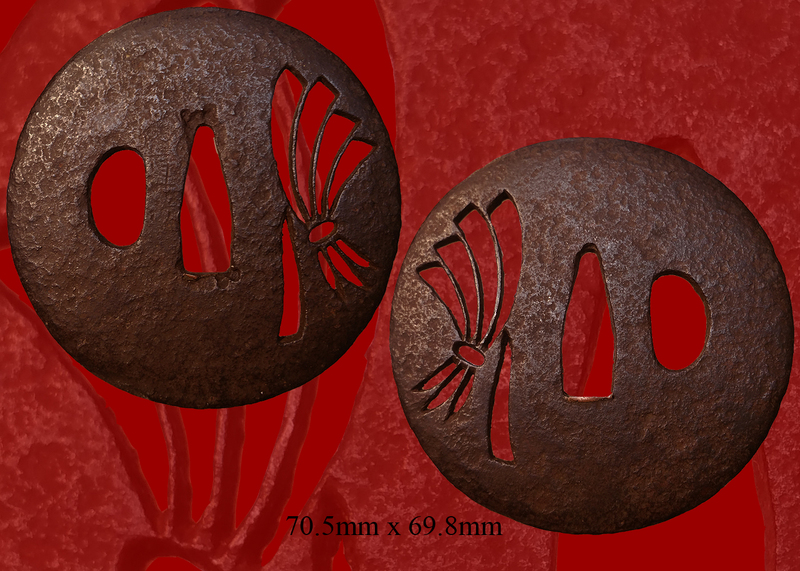 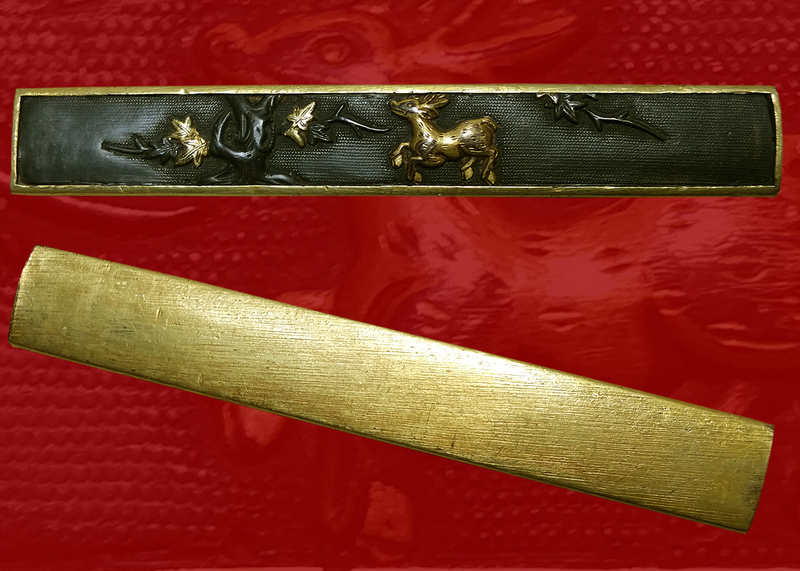 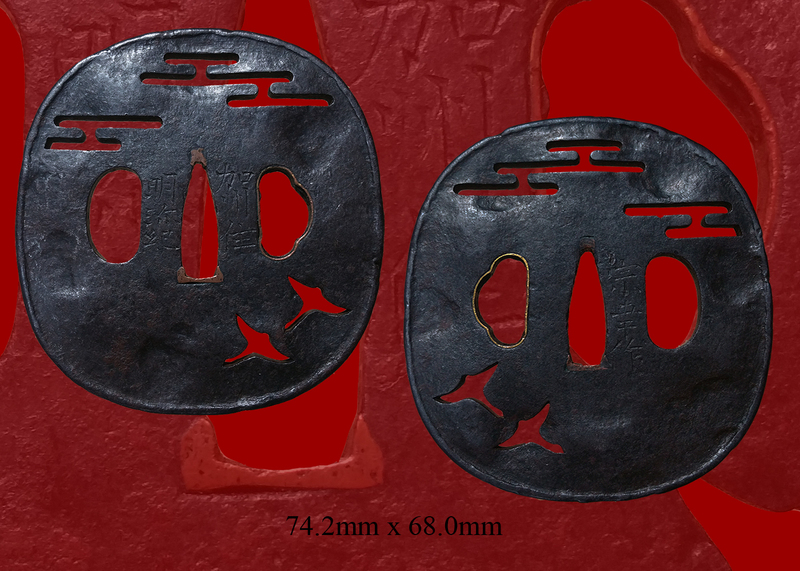 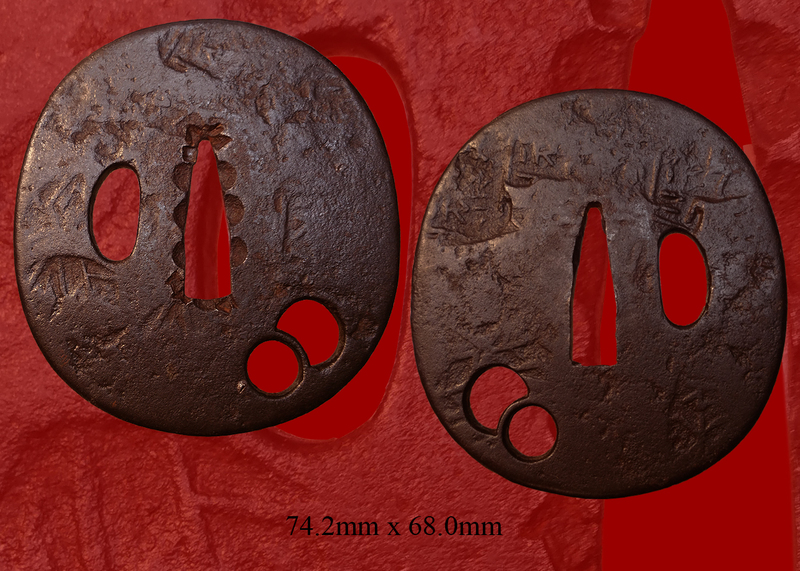 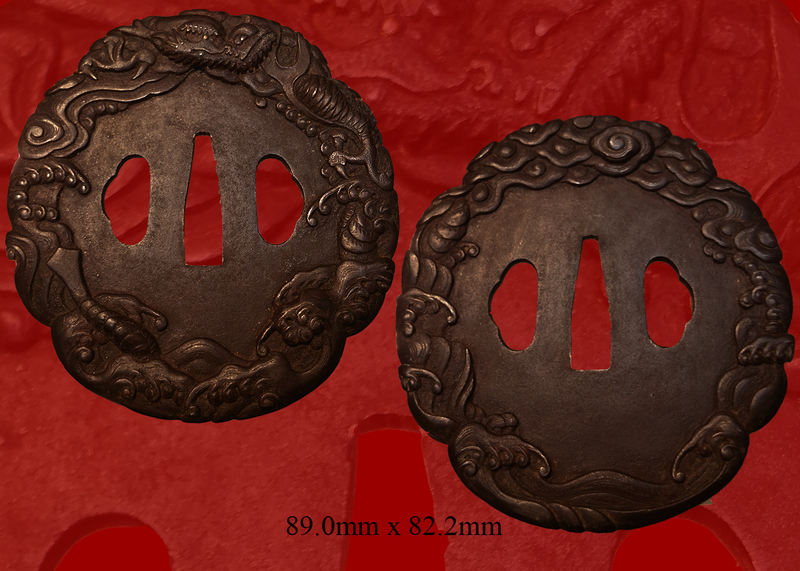 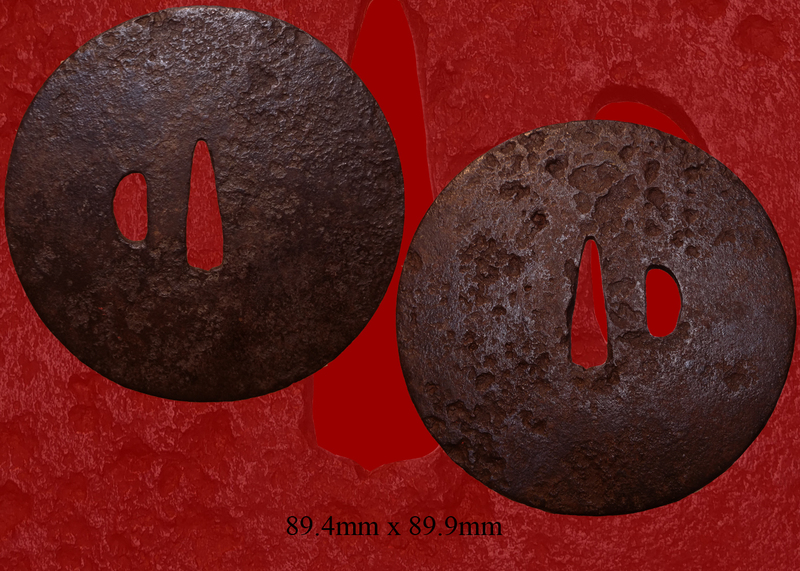 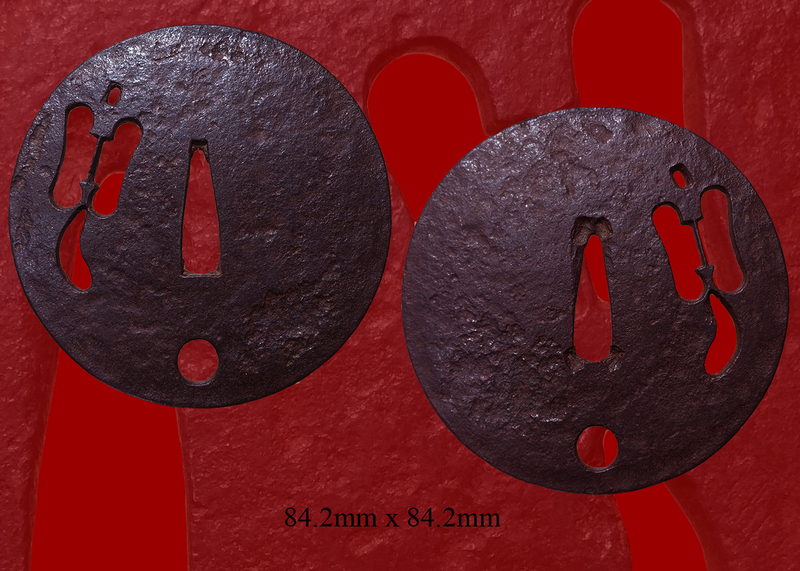 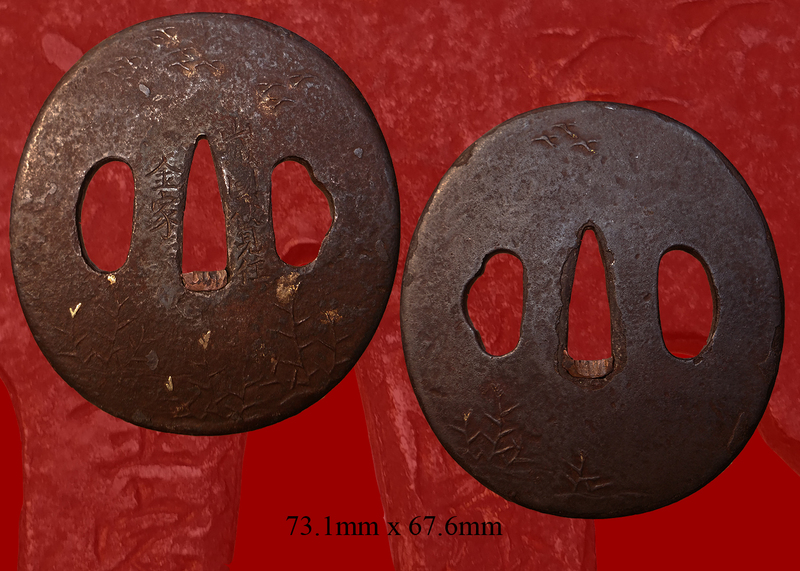 The tsuba is of iron with boars head piercings around the perimeter of the blade. 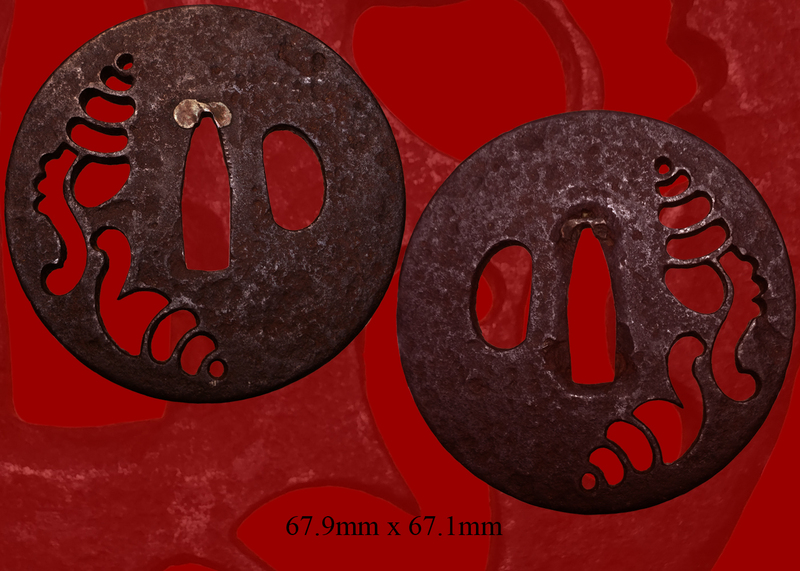 Email us if your interested in this item and remember to include the order number for this item: fss-767.